ZSMJ and Banana to round out ‘dream team’? While the ‘dream team’ has basically confirmed its 1-3 roles as Hao, Mu, and xiao8 respectively, the new team’s 4-5 positions saw much uncertainty as only recently, originally rumored additions ChuaN and Faith have both been said to be returning to iG after the break. In their place, newest information suggests that ZSMJ and Banana will be joining the ‘dream team’. This essentially leaves TongFu with no first team squad remaining, so along with seeing this new dream team unfold, another point of interest will be to see how TongFu might look to recover. There’s also the chance that KingJ may be involved in all this somehow. After being relatively inactive in the past few months, yesterday he posted on his Weibo two posts suggesting he was about to make a return, saying that “It’s almost time“, and “See you tomorrow guys“. EHOME’s 71 to DK as coach? 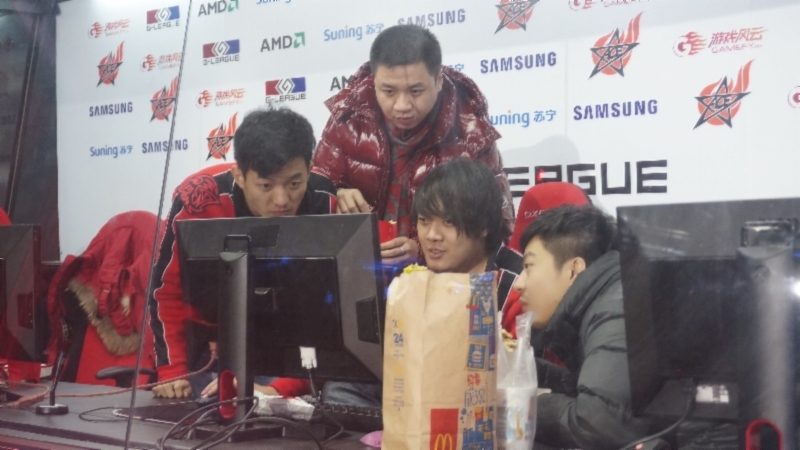 Former manager of EHOME, the behind-the-scenes force during EHOME’s legendary run in 2010, 71, was seen at G-League with BurNIng and the rest of DK recently. Rumors are that he’s joined DK as their new coach, or has plans to do so… In the recent DK player bios, both LaNm and BurNIng listed their EHOME manager 71 as the most influential person in their careers. And in a recent Weibo post from 71, he himself included BurNIng and LaNm as amongst his best players. The respect is certainly there. DK has quietly re-assembled three of EHOME’s best ever players; if this rumor of the former EHOME manager and coach joining proves to be true, is this the missing piece that DK has been looking for all along? Sylar’s reaction to rOtk’s statement reveals a bit more of his own situation…? rOtk posted on his own QQ Weibo a response to being taken off of the DK roster. In response to this, someone posted, “The first one” (essentially saying that this is the start of the official changes within Chinese Dota). This all comes in the midst of rumors amongst fans that Sylar was to join DK soon… the plot thickens?